From problems in China to interest rates here at home, here's why Bank of America's shares have floundered since the beginning of July. The third quarter was rough for stocks in general, but particularly for banks. The KBW Bank Index, which tracks the share prices of 24 major banks, dropped by 10.6% in the three months from the beginning of July to the end of September. Bank of America (NYSE:BAC), its most heavily weighted component, played a role in its decline, dropping by roughly 10% over the same stretch. What caused shares of the nation's second biggest bank by assets to fall so far so fast? Four factors seem to have played a role. Bank investors have been waiting for the Federal Reserve to raise interest rates for over a year. But while the central bank has insinuated on multiple occasions that it's on the verge of doing so, it has yet to pull the trigger. 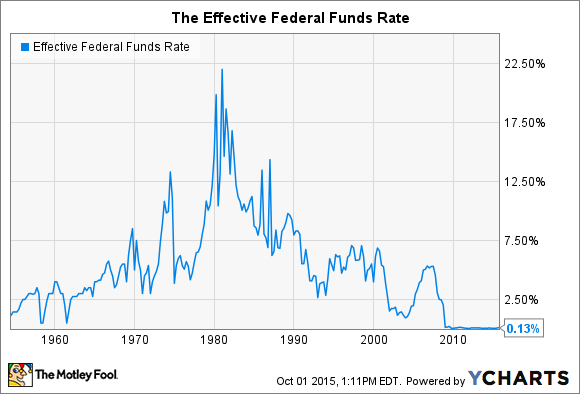 This is why the benchmark Federal Funds rate is still less than 0.25%, an unprecedentedly low rate for such an extended stretch of time. This is bad news for Bank of America and other banks that generate revenue from floating-rate interest-earning assets, which yield more when rates are higher. According to Bank of America's projections, it will earn $2.4 billion more each year in net interest income if the Fed Funds rate increased by a single percentage point. Bank investors were thus understandably disappointed when the Fed declined to raise rates at the latest meeting of its monetary policy committee in September. Although interest rates are the most important variable right now for bank stocks, the dour outlook for China's markets and economy was the initial spark that ignited the broad-based correction in stock prices. 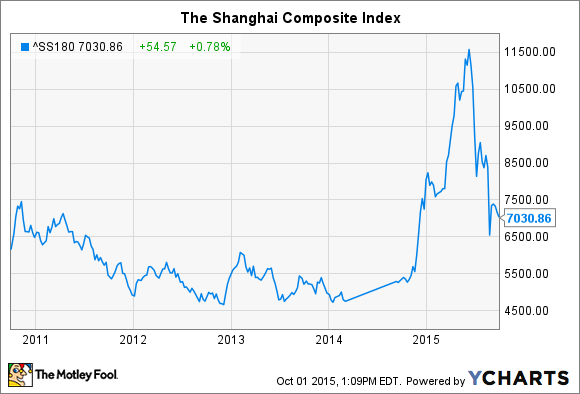 China's stock market is in the process of a substantial correction itself. Since peaking in June, the Shanghai Composite Index has fallen by 40%. And even more problematic are signs that the country's fundamental economy may be following suit, as its manufacturing sector has contracted for two consecutive months. While this is bad news for Bank of America, it's not because the Charlotte, North Carolina-based bank has massive exposure to the East Asian country. It reported $12 billion worth of direct exposure in the latest quarter, split between funded loans, unfunded lending commitments, and securities or other types of investments. The problem instead is that a faltering China could impede the global economic growth that all companies, including banks, rely on to buttress revenue and earnings. It's reasonable to argue, moreover, that concerns about China were one of the reasons that the Fed declined to raise rates last month. A third reason Bank of America's shares suffered in the third quarter stems from the bank's own warnings. At an industry conference last month, Chairman and CEO Brian Moynihan echoed comments from Citigroup executives who predicted that trading profits would be down by 5-6% in the quarter, thanks to volatility induced by the issues in China. Although profits from trading account for only 17% of Bank of America's noninterest income, and 9% of its net revenue, the projected drop nevertheless equates to $100 million in lost income. This is a non-negligible amount for a bank that's earned an average of $2.5 billion in each of the past five quarters. Finally, Bank of America's decision last year to promote CEO Brian Moynihan to be the chairman of its board of directors didn't help to endear the $2.2 trillion bank to shareholders, a majority of whom had voted to separate the roles in 2009. A follow-up shareholder vote last month affirmed the board's 2014 decision to recombine them. By then, however, the bank had been dragged through the mud for months by analysts, commentators, institutional investors, and shareholder advisory firms. Bank of America's Chairman and CEO, Brian Moynihan. Image credit: Getty Images News/Thinkstock. As I discussed at the time, there's little to no evidence that combining or separating these roles has any impact on a company's performance, much less its share price. However, the prolonged negative coverage triggered by Bank of America's unilateral decision to recombine the roles without first seeking its shareholders's approval could only have had a negative impact on the company's share price.